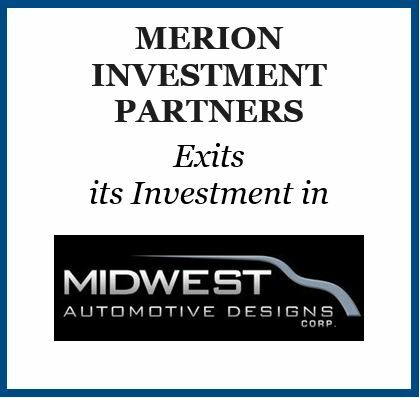 Merion Investment Partners is excited to announce a successful exit from Midwest Automotive Designs LLC, a leading custom van upfitter, through an acquisition by REV Group (REVG) a $2+ billion manufacturer of industry-leading specialty vehicle brands and leading provider of parts and services. Merion acted as the lead investor and teamed with Petra Capital Partners in the purchase of the company in partnership with Pegasus Capital. We are pleased to have had the opportunity to work with the excellent management team we recruited to the company to support its founder, Tim Gray, who remained a significant shareholder, in accelerating the growth of the business. Merion believes this transaction reflects the profile of how we work with partners and sponsors to support change of control transactions in our lower middle market focus industries. Headquartered in Elkhart, IN, Midwest develops and manufactures luxury vehicles for end segments including motorhomes, shuttle vans, limousines, and customized executive transportation vehicles. During Merion’s investment period, the company grew revenues and EBITDA at a CAGR of 32% and 24% respectively.